As the next line of the Alan Jackson song goes, "It gets hotter than a hoochie coochie," and that's true about anything you do in the month of August. 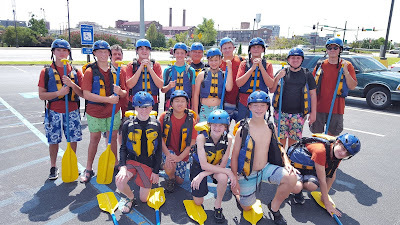 So, Troop 50 heeded Jackson's advice and took the water — literally — by braving the whitewater of the Chattahoochee River on Saturday, Aug. 19. In what has become an annual excursion, Scouts and leaders donned helmets and equipped themselves with paddles for a few hours of whitewater adventure. 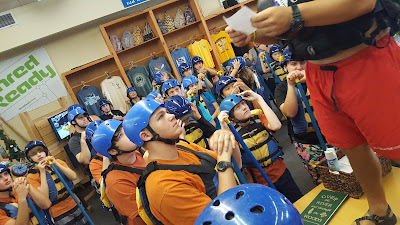 Scouts pay rapt attention to the pre-rafting safety presentation. Filling two rafts and three "ducky" inflatable whitewater boats, the troop set out from the Phenix City-based Whitewater Express outfitter. The excursion down the Chattahoochee River, bordered by portions of Downtown Columbus, included several rapids and a lazy river-style stopping point. Thankfully, all Scouts and leaders departing on the whitewater excursion were accounted for at the end of the trip! The whitewater outing officially marks the start of the troop's 2017-18 year. Look for more blog posts recounting the troop's activities to come! For more photos from the trip, visit the troop's online photo album.